Deep in the throbbing heart of Texas, the hill country hospitality of San Antonio draws in families, couples, singles and conventioneers alike. Always renovating and evolving, it is #7 on Forbes’ list of top golf cities. The JW Marriott is the newest pride of San Antonio, appearing from the TPC Parkway as a modern day castle atop the high hill. All around, the palatial theme mixes ostrich skin barstools, blown glass, Remington motif and nine -pillow beds. The resort’s AT&T Oaks course was preparing for the Valero Texas Open. Playing a course where the pros compete enhances the golf experience. Designer Greg Norman’s voice through the GPS system delivers course tips at every tee box. Pay attention to the pin placement as many of the greens are Texas sized and can leave a very long putt. Some bunker edges emulate the canopy of the native oak trees and all have thick sand that Lawrence of Arabia would have difficulty escaping. The unusually forgiving Pete Dye design of the resort’s second, AT&T Canyon course allows even high handicappers a chance to score well. Views are intensified by the 700 acre preserve of hillside oak forests, with a bounty of spring blooms, including the famous blue bonnets. For anyone outside of Texas, these would be recognized as monochromatic midget lupines. A closed irrigation system is part of their “greenitiative”. It recycles rain water and maximizes course drainage for dry play even after very wet days. The 20 acre TPC Tour Academy instructs all level of players on fine tuning or drastic swing changes. From the grand courtyard waterfalls to the 6 acre park of rivers, slides, fountains, and pools, water soothes the soul. Our timing however coincided with different water, torrential rain, ending a 3 year draught. Nonetheless, we braved the storm, playing one hole at the Westin La Cantera Resort Course, former home of the Open for 15 years. What a great first hole – a 665 yard par 5, with a 125 yard drop from tee to green. With bucket rain hats and umbrellas in hands, we delighted in long drives down the flooding fairway. The cart path converted into a Jurassic like scene and the clubhouse summoned our return, possibly saving our lives, since lightning struck as soon as we returned. For a few hours, traffic lights were out and all San Antonio became a water feature. We’ll be back for the last seventeen. Fortunately, the JW Marriott is conducive to rain or shine. Rocking beside a fireplace under the tall portico, sipping drinks and eating gourmet brisket with the smell and sound of fresh rain, who cares about the weather? Inside are game tables and shelves of books to while away the hours. The High Velocity Sports Bar has big screens like the drive-ins of old, or you can lounge the day away in the Lantana Spa. With over 300 days of sunshine, you are more likely to hit the walking/biking trails or head to the San Antonio River Walk. Barge cruises are a recommended blast along with the shopping and restaurant experience. For more golf, try The Quarry, recycled from a mining operation with lakes, once pits, now serving as the watery graves for errant shots. When your ball lodges in the boulders next to the limestone walls reaching 100 feet high, you may spot them but, best not retrieve them as the warning signs below heed the danger of rock climbing and snakes. One slithered across our path when leaving the 17th green, rearing his ugly head high above the grass in a threatening manner, but continued on. On the “Gibraltar Hole”, black squirrels inhabit the green, looking much akin to the Barbary apes. The San Antonio hill country stimulates a cowboy sense so strong that while in San Antonio, even the Pope got a Stetson hat at Paris Hatters. There is something for everyone, including 6 Flags, Sea World, the top rated Schlitterbahn Water Park, museums, breweries, ranches and more. The Alamo of course, is San Antonio’s biggest historical claim to fame where Davy Crockett surrendered with 7 men and was then brutally killed. One survivor later led the battle of San Jacinto shouting “Remember the Alamo!” and the territory was won. Some dispute the account so it’s hard to know what to believe. 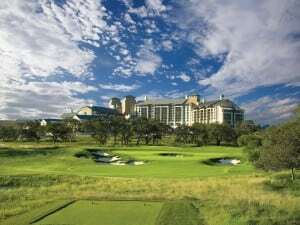 Believe this though, that San Antonio is one of the best travel destinations for heritage, entertainment and golf!